It's the last day of term tomorrow and the reception classes have been encouraged to make an Easter Bonnet to take in ready for their parade. 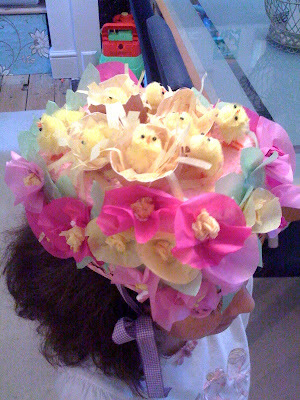 Even though I have been assured by one of my Book Club Mums that it is possible to make a perfectly acceptable Easter Bonnet out of a cycling helmet in a matter of minutes (she is talking from experience!) we decided that we'd make a start last weekend. Macy's bonnet is made from the box our Riverford tomatoes come in which she painted pink, the egg shells are from our baking session at the weekend, we glued in the chicks (or ducks as Evie calls them along with pretty much any bird) and we finished it this evening with lots of tissue paper pink flowers. Macy is very happy with the result and can't wait to were it.